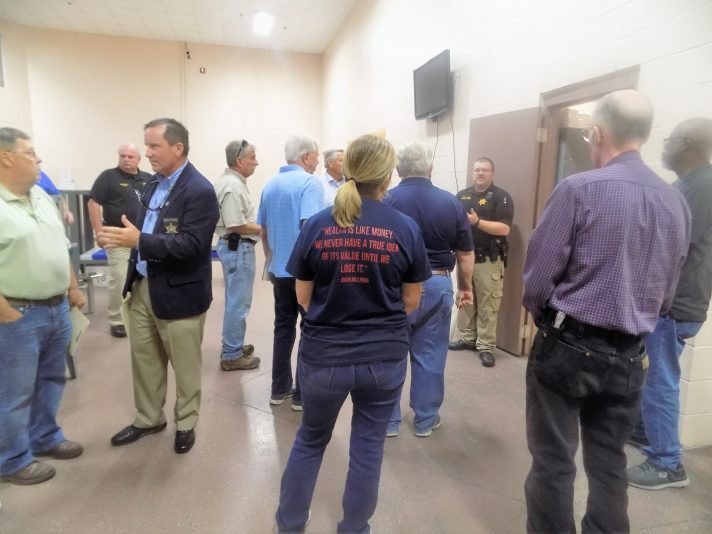 Paris, Tenn.—The Henry County Commission held a work session Wednesday to hear details of a proposed Work Release Initiative from the sheriff’s office. The meeting was held at the jail and included a tour of the pod that would be used for the program. It included presentations from Henry County Sheriff Monte Belew, Sgt. Daniel Powell who is proposed to be the director of the program, Kenny Chesser of the Dyer County Sheriff’s Office, and Paris TCAT President Bradley White. Belew said he and County Mayor Brent Greer visited the Dyer County program, which the local program is being patterned after. The commission will vote on the program at its regular meeting next Monday. Also attending today’s meeting was Paris Mayor Carlton Gerrell and County Attorney Rob Whitfield. The goal of the program is to provide inmates with the opportunity to re-enter society with the skills necessary to lead a productive life and be better prepared for the transition back into the community. A major goal is to decrease recidivism. The work release housing unit will house up to 32 participants, he said, but the program will begin with 10 inmates. All will be state inmates but it will not be open to all, he said. They will have to meet certain criteria: no escape history; no violent convictions; no sexual assault of criminal acts of a sexual nature; no felony arson, robbery or use of a deadly weapon; no multiple convictions with assaults or violent behavior, etc. Under the program, inmates will pay $20 a day to work. $4 will go for an ankle bracelet, with $16 going to the general fund to pay for basic clothing, lunch, transportation. With 10 inmates working five days a week, it will generate $40,000 a year for the county general fund. With the full 32 inmates, it would generate $133,000, Belew said. So far, one local employer, PML, has stepped up and wants to hire the first 10 inmates, he said. They will go to work there by the end of October. An educational component will be included as time goes on, with instruction from the TCAT, which will be provided free. The best part, Belew said, is that once the inmates get out of jail, they will already have a job. And they will already have money built up in their commissary fund with which they can pay to get their driver’s license back or get an apartment. And, a percentage goes to the local courts to pay their fines and fees, which means inmates will be free and clear of that burden when they are released. The housing unit for the inmates in the program is totally separated from the rest of the jail, with its own entrance. Photo: Sheriff Monte Belew, left with blue jacket, and Sgt. Daniel Powell, right, at door entrance, show commissioners the housing unit in which work release inmates will be housed. (Shannon McFarlin photo).